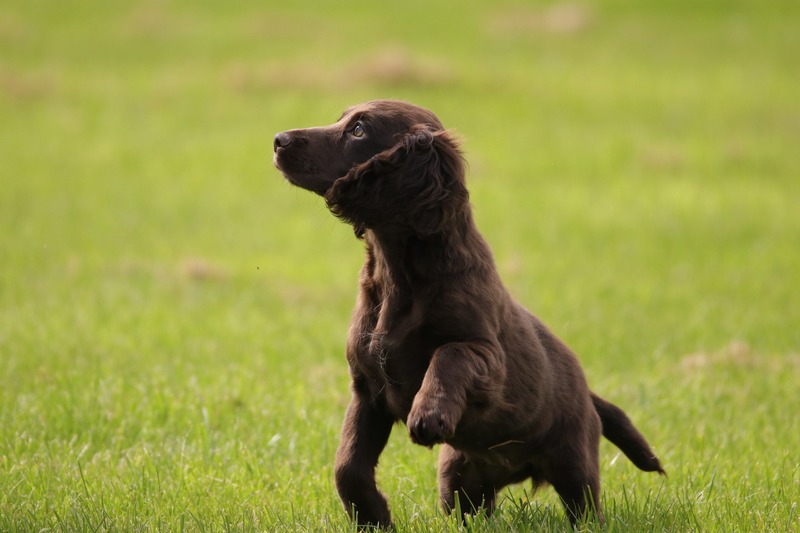 Gundogs have a job to do, and if you have recently acquired a puppy to train up to be on the field, then you need to do so early, whilst generally maintaining their overall health. To begin with, puppies in training need to know the basics such as toilet training, responding to being called back and generally being well behaved by around 10 months as this builds the foundations for in-depth training. For future gundogs, it is important not to punish or harshly correct a puppy for carrying something they shouldn’t, such as a shoe, as this could teach them that retrieving items is a bad thing. Instead, take the item from them gently whilst saying “dead”. This will get them used to the action and will show that they have done well, as well as helping teach them to drop an item. When introducing a puppy to heelwork, it’s important to keep the training interesting by walking in straight lines, figures of eight and occasionally turning left or right or altering the pace. This will ensure that they continue to stay focused on you throughout training and are prepared for real situations once in the field. The same goes for retrieving and training, as your puppy needs to be kept entertained and on their toes, else they will lose interest. Using dummies in training and practising regularly will help to build your dog’s knowledge and understanding of what is expected of them in the field. When using a dummy, it is important to remember to lift your puppy’s top lip out of the way when putting it in their mouth in order to teach them how to handle prey properly. You must also use the “dead” command when taking it away again to teach them to drop the prey. By using your hands, you can encourage them to bring the dummy straight to your hand and ensure that they keep their head held high, making sure not to drag the dummy or prey on the floor. You must remember that a positive attitude needs to be maintained throughout training, as your dog may sense that you are getting frustrated if they are taking a while to pick something up and may think that they have done wrong. It’s also important to ensure that your puppy has the best diet to keep them fit, healthy and active for longer. At Alpha Feeds, we can provide you with food for dogs of all ages to ensure that your working dog remains in the best shape and performs to its very best. For any advice on feeding your gundog puppy, email info@alphafeeds.com or phone us on +44 (0)844 800 2234. Your dog’s nutrition is just as important as your own, so it’s essential that you ensure they are getting the right amount of protein in to their diet to keep them healthy and active for longer. Working dogs need a good quality, sustainable diet to keep up their strength for the long working days ahead of them. They need to be able to keep up their energy to stay active and the protein in their diet aids in doing this. Protein works to build their strength and preserve their health as well as maintain their energy through the day. It also offers calories which can sustain the needs of active and working dogs for a longer period of time. Protein provides your dog with stronger muscles, greater bone and body mass, improves nerve function, aids the creation of cells and can help in healing your dog’s wounds. Your dog will even benefit from having a shinier coat and healthier skin due to the higher level of protein. All dogs need protein in their diet, but choosing the right food for your working dog is essential even from a young age as this will help to build their strength and energy through to adulthood. At Alpha, we offer a range of different foods for both active puppies and adult dogs, which are nutritionally balanced and formulated for health and vitality. Our foods range from 19% to 32% protein, helping you to choose the right food for your dog depending on their purpose and high performance. What makes a good gun dog? There is a good reason why a Labrador will happily spend hours chasing and retrieving a ball, and why a spaniel has bundles of energy…they were bred that way. Years of breeding ensured today’s gun dogs had the necessary traits to do their job well…but what makes a good gun dog? It is a common misconception that working dogs are not shown any love. In fact, there is nothing quite as special as an owner’s relationship with their working dog. A close and fulfilling bond increases the dog’s motivation to do their job well to please their owner, and a good relationship will ensure your gun dog will also enjoy being with you out on a field, and relaxing with you at home. That trust between the owner and dog is vital for a strong working relationship. What makes a good gun dog will depend on the type of job you want your dog to do. Different gun dogs will be better in different areas of shooting and hunting. For example, springer spaniels are one of the preferred dog breeds when it comes to pheasant and bird hunting, specifically due to their agility and stamina. On the other hand, for deer hunting, dogs such as Labradors are trained how to hunt deer and be quiet. Ultimately, what makes a good gun dog is good training. Whatever breed of dog you get, training is essential if you want your dog to be efficient and reliable. Training will normally start when your dog is just a pup with fun games like fetch and drop. Dogs, like humans, need to stay in good physical shape, and this is especially true for a gun dog. If your dog isn’t in shape, or isn’t eating the right food, then they simply won’t have the energy they need for their activity level whatever the season. They are unlikely to perform to their best, regardless of how well trained they are. As a responsible owner, you need to ensure that your trusted pooch is exercised the right amount and eating the best food possible for their level of activity. Owning a gun dog doesn’t have to be all work, it’s a pleasure too. If you would like to contact us for any advice regarding feeding your gun dogs, email us at info@alphafeeds.com or phone us at +44 (0)844 800 2234. When did Notts Supadogs begin and how did it get started? Notts Supadogs was formed in August 2008 by Joanna and Martyn Bonner. After running for many years with other teams, they decided to start their own club to give people in North Nottinghamshire and surrounding areas the chance to take part in flyball. Flyball is pretty much a relay race for dogs. There are 4 dogs in a team (and up to 2 reserves) who each race down a 51ft lane, jumping 4 jumps on the way to the spring-loaded box, which releases a tennis ball on impact. Having grabbed the ball, the dog then returns down the lane and over the jumps. Dog number 2 then goes followed by dog 3 and 4. The winners of the legs and ultimately the race (best of 5 legs) is the team who completes the course with no faults and in the fastest time. What type of dogs do you have on your team? Most breeds can compete in flyball; however, it is important your dog is sociable with other dogs, has a good recall and is relatively fit. Strangely, being ball orientated is not necessarily vital! 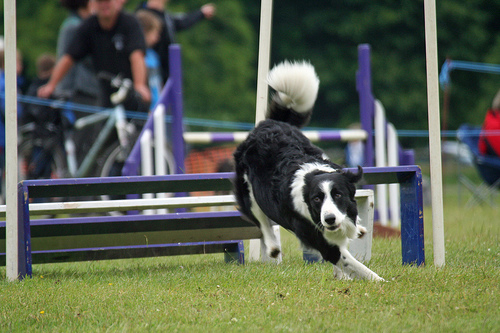 What qualities make a dog good at flyball? Anyone wanting to start flyball will ideally have a dog or dogs with the qualities mentioned previously. A fair level of commitment is required, as training and racing in competitions takes up a lot of time. However, the more time and effort you are willing to put in, the more you will get back. It is a great way of meeting like-minded people who enjoy the excitement and fun associated with the sport as much as you do. Remember, patience is key for you and your dog to become a success! What are your top tips for anyone who is thinking of getting into flyball? Anyone wishing to enquire more about the club should simply email nottssupadogs@hotmail.co.uk or leave a message on the Notts Supadogs Facebook page. If you are not local, have a search around for other flyball pages that may be nearer to your location. How has Alpha Feed’s sponsorship helped you? “Being sponsored by Alpha has benefited the club in many ways, including purchasing equipment, which has helped augment training levels. Alpha have also been able to provide goods for prizes to winners and runners up of divisions at Notts’ own hosted tournaments, and also given informative advice on feeding and nutrition. Have you ever considered owning this athletic breed for your domestic pet? If so, read on to find out more about this traditionally stubborn breed. A husky dog’s core function is to work, and in particular to pull and run. Not surprisingly, this is why they have been used to pull sleds over long distances in Siberia for centuries. However, as your domestic pet, you should consider getting them to pull you on a bike or scooter. 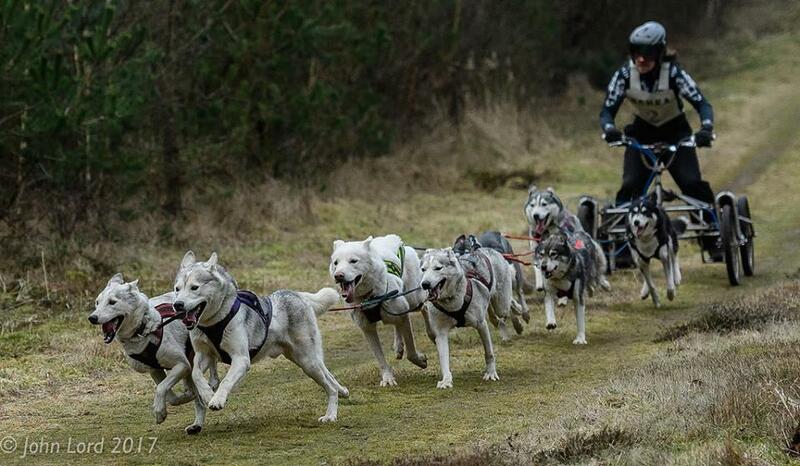 Some huskies enjoy regular walks but this can be difficult for the owner as they will always pull on the lead. This will be difficult to stop as they have pulled for centuries as sled dogs. Do not use a retractable lead as this could cause your husky to pull even more. Alpha Ferret Feast is a complete, ideal way of feeding your ferrets, meeting the nutritional needs of working, pet and show ferrets. It is a premium feed, containing a high proportion of poultry meal (min 26%) and fish meal (15%) which are recognised as some of the best sources of meat protein. 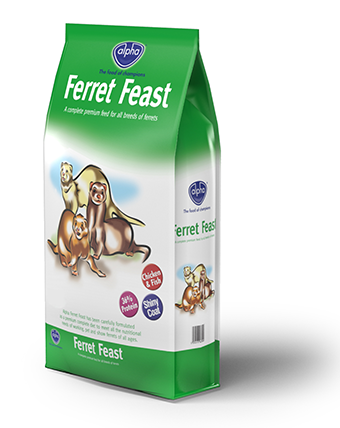 Easy to feed, Alpha Ferret Feast removes the odour associated with some feeding regimes, and contains all the vitamins and minerals needed to keep a ferret in excellent health. 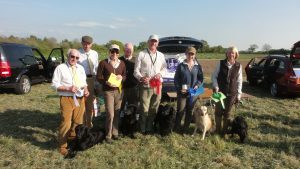 The United Retriever Club (North Midland Area) held an Open Working Test for Any Variety Retriever on Sunday 7th May 2017 at Cubley, Derbyshire by kind permission of The Hon. David Legh. 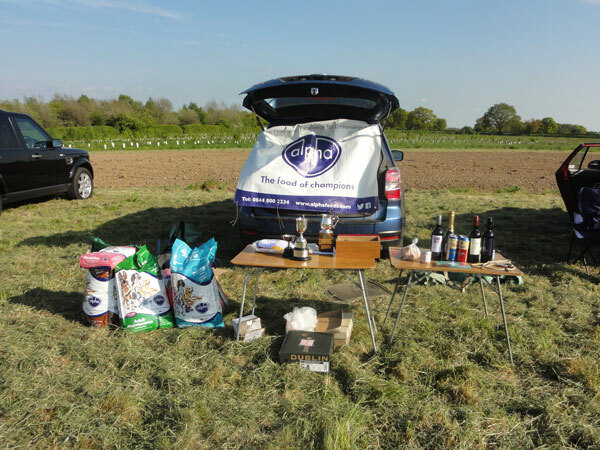 32 dogs were entered and prizes were generously sponsored by Alpha – the food of Champions. The weather was warm and sunny, pleasant for dog work and also lunchtime picnics. The judges were Derek Capel and Guy Radford. With Steve Crookes as chief Steward. The morning tests involved a walk-up through a young plantation of trees. The two judges had four dogs in line, for three retrieves each. These were a forward mark, a diagonal mark and a tricky diagonal blind behind the line. After lunch there were two double retrieves. Guy judged near a small pond, with the dogs sent first for a blind, followed by a memory mark across the pond. On rolling pasture Derek judged a double mark, the dog picking one in the middle distance first, then sent back over a brow and out of sight for the more distant one. During the day most all the tests had produced their share of failures, so the number of clean dogs was fewer than usual. Mr & Mrs Legh and Headkeeper Kim Robinson had watched the afternoon proceedings and were there for the presentations. Photo of Prize winners attached L-R P Birkbeck, G Radford, J Fairclough, D Capel, G Ellison, C Jeffrey, S Corden. Whoa, brakes on as our race season has come to an end for 2016/17. It’s been another fantastic season for Mystic Charoite Racing. In spite of amazing lead dog Rogue still on maternity leave at the start of the season and Brew suffering an injury that put him out of action for three months, our incredible dogs still got us on the podium at least once at just about every event we attended over the winter with (I think!) around 13 first places. 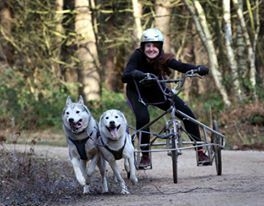 In terms of championships, the teams brought home a Silver Medal in the British Siberian Husky Racing 4 Dog Championship and a Silver in the Four Dog Nordic and Bronze in the Six Dog Nordic classes in the British Sled Dog Sports Federation Championship Series. The races may have come to an end but the work doesn’t stop. Spring training is probably the best as we have lighter nights to enjoy and we also have Rogue’s puppies (all six of them!) to bring on so they can join the race teams next season. We also have exciting plans to make as we are hoping to broaden our horizons and do at least one race overseas next season – the question is, will it be on dryland or will it be on snow? Grateful thanks to Alpha Feeds for continuing to support us and keeping our dogs fuelled by Alpha High Performance Dog food. Pics are by John and Angela Lord and Siberprint. 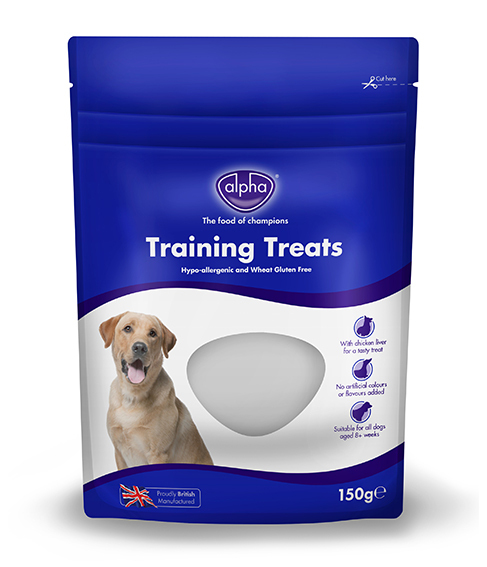 Alpha Feeds has launched new Training Treats which are hypo-allergenic and wheat gluten free. The Alpha Training Treats include chicken liver and they are suitable for all dogs over eight weeks old. These healthy bites are free from artificial additives and are a tasty treat for dogs that deserve a reward whether on a puppy training routine, as encouragement for good behaviour or when working, sporting dogs are learning a new activity. 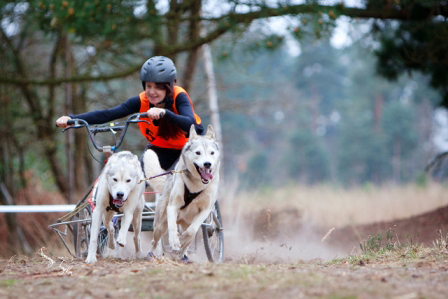 A world away from the desolate icy wastelands of Siberia, husky dog racing is alive and well in the rather incongruous setting of the British countryside. 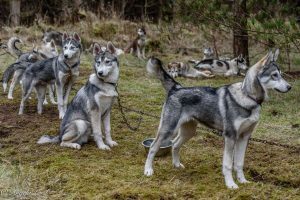 Now in its twentieth season, the British Siberian Husky Racing Association was formed by a group of Britain’s leading Sled Dog Drivers in 1996. The rules are stringent; every race is electronically timed to 1/100th of a second and believe it or not, after 5 miles, a race has been decided by 5/100th of a second – here we find out more. In sled dog racing, men and women can compete on an equal footing, and no matter who is racing, this is fantastic entertainment, for both competitor and spectator. The sport is growing, numbers are increasing and there is a thriving junior competition each year. Training of young dogs starts at an early age over short distances. When a dog reaches one-year-old, it is allowed to compete in races. A regular training programme is essential for success – in the winter season sometimes four times a week for competitive teams. However, one of the biggest challenges continues to be finding suitable trails in Britain. Husky dogs have been constructed to work and their build is designed to cover as much ground, expend the least energy and suffer the least physical shock and stress as possible. The design of racing sleds today is very similar to those used in the early days, although modern materials have more or less replaced traditional wood. With this, weight has changed too, from around 50kg for a 4-dog team to some now weighing as little as 15kgs, mild and stainless steel being the preferred materials. 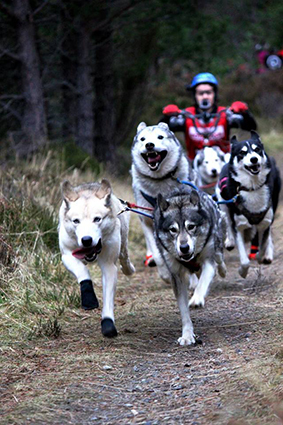 Each dog in the team wears an individually-fitted harness, with attention to comfort around the neck and shoulders. The dogs are hitched to the sled by a central rope known as the ‘gang line’, then with brass clips, the dogs are attached into the lines. Teams are divided into classes based on the number of dogs in the team. Before the start of the race, it’s highly enjoyable to walk around the rally site. Here you can watch mushers getting their teams ready to run. If time permits, most people love to talk about their dogs, but they have to keep a strict eye on the time as they have specific set times to present at the Start Chute. Each team is released at timed intervals. Excitement levels are high. The Start Chute is noisy and hectic, but seeing the enthusiasm and eagerness of teams of dogs straining to start the race is an absolute must. The finish line is noisy too but by the end of the race, it’s no longer the huskies making all the noise, but excited family and friends cheering and encouraging their favourite teams across the line. In between the start and finish, out on the trail itself, it is important that spectators stand well back so they don’t alarm the passing teams with any sudden movement. There are marshals at regular intervals along the trails and it is imperative that spectators listen to any instructions they give. To get the best results from these dogs, not only is training important but the correct diet is essential. Feeding depends very much on the level of exercise but a husky that is working in harness does well on a diet such as Alpha High Performance where meat is the first ingredient and there is the right protein/fat ratio. It is important to store food safely though, to avoid dangerous bingeing, as given the chance, huskies would eat at least five times a day by helping themselves! Alpha Feeds has launched an exciting new sponsorship search! Whatever your chosen discipline, gundog events, the sport of agility, showing, flyball, or sled racing the competition is open to everyone and the North Nottinghamshire-based team want to hear from you!